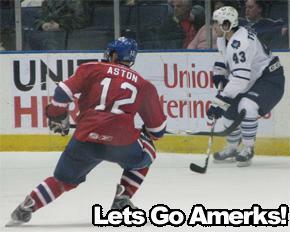 Amerks Lose In Overtime · Let's Go Amerks! The Amerks lost to the Toronto Marlies in overtime on Friday night by the final score of 3-2.Â Marek Zagrapan and Mark Mancari scored the two Amerk goals which both came in the third period.Â The Amerks were ahead 2-1 in the game until 5:01 remaining in the third the Marlies Chris Harrington tied the game.Â In overtime Jeremy Williams scored the game winner at the 1:20 mark. The Amerks are now on a 9 game losing streak (includes OT and SO losses), and have lost 25 of the past 27.Â There last wins were January 12 and December 28. The Amerks and Marlies face off again on Saturday afternoon at 4pm in Toronto.Â You can listen to the game live on 1280 WHTK or watch it live on B2 Networks. The Amerks are back at home on Wednesday February 6th against the Syracuse Crunch.